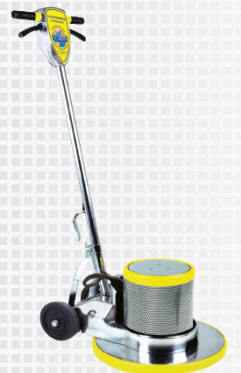 Floor buffers: Machines And Carpet Cleaning Equipment at discounted prices. Floor buffers come in many different shapes, sizes and power. This paragraph is a brief description of the types of floor buffers or floor machines. 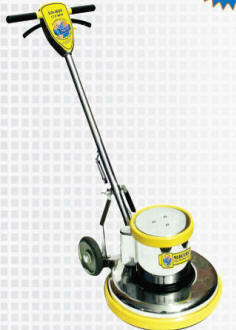 If you are looking to strip floors of floor finish you need a 175 rpm floor machine or floor buffer. 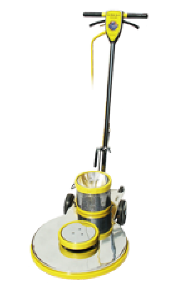 This type of machine is also used for floor cleaning, floor buffing, carpet scrubbing with a brush and carpet bonneting with a carpet bonnet. A standard 175 rpm machine usually uses a 1 horse power motor and comes in a number of sizes from 12" to 24". Many manufacturers offer a 1.5 horse power upgrade. I like the upgraded machine for carpet bonnet cleaning. If you really want a good shine on your floor you would want to use a burnisher. This type of machine is usually 20" diameter with a 1.5 horse power motor. The pad speed is 1500 rpm or more. The burnisher does a better buffing and will shine allot better than a standard 175 rpm machine because the friction of the pads on the burnisher actually melts the finish creating the high shine many people desire. The burnisher can not be used for stripping floors. For large floor such as schools or supermarkets it pays to use a propane powered burnisher. They are faster in time it takes to do the floor and pad speed which will give you an even greater shine. 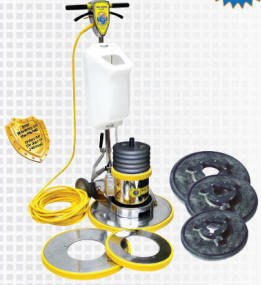 Their are also specialized floor machines for marble restoration, wood floor care and for use in explosive environments. Please feel free to contact us with any questions. Manufacturer specifications may change due to availability of parts.